It has been awhile since I have had a deadline to get a post written. 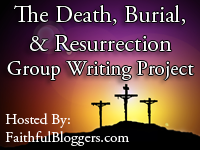 A week ago I said 'yes, sign me up' to this writing project thinking I have plenty of time to come up with something about the death, burial and resurrection of Jesus. Easy, right? It is due April 1, and it is now 9:20 on Thursday night. What to say about a subject that is woven through God's Word from Genesis to Revelation? What to say that hasn't already been said? I want to be original and I want my "outstanding post" to be read by many. I want to help others understand how great God is and what He did to make me His friend...these thoughts and many others have kept me from writing this post until tonight. Those thoughts and motives are full of 'Jody' and not Jesus. My intentions and ideas have not sprung from a heart and mind spent in prayer regarding this subject, but of trying to come up with a catchy title and a post to match. But isn't that what Jesus came to do? Show me my sin and pride, nail it to the cross where he died? The death, burial and resurrection of my Savior now enables me to come boldly into God's presence through his shed blood. (Hebrews 10:19), confessing my sins to a loving God who calls me his daughter, because of Jesus' blood and his righteousness. who is abundant in mercy because of His great love for me, made me alive with Jesus even when I was dead in my sins, I am saved by grace through faith, it is God's gift and I am forever His"
I don't need to elaborate more on the subject. It's in the Bible, Old Testament and New. Read it for yourself, it will change your life forever. It is hard to put into words what Christ did on the cross. He was our living sacrifice, so we didn't have to pay for our sin with death. Until you understand the cost and the payment for those of us who were even adopted into God's family, not the chosen people, do you start to grasp His amazing and powerful love for every single person. Honest. I like it. And this is probably all you needed to write to glorify him. Well done, Jody. I tell people who are questioning God's love for them to take one chapter a day from John and read it, asking God to reveal Himself. Who can remain the same after that? No one. Thanks Jody for a wonderful post glorifying Him and thanks for visiting my post and leaving a kind comment. Blessings!